Tom and I barely knew one another when we got married. Well, at least it seems that way when I look back on things. Engaged only 3 months, we were still getting to know one another on our honeymoon. It was our first time. Hiking. Pipestem State Park in West Virginia has some beautiful hiking trails. And since that’s where we went for our 4 day honeymoon, we hiked. We did other stuff too (coming soon: Golf vs Hike) but it was our first hike together. Just a slip of a girl along side the man of her dreams, we headed to Heritage Point, an outcropping of rocks that overlooks the Blue River gorge and our little hotel located on it’s banks. (Cool fact: The only way to get down to our hotel was by cable car. Inconvenient but very romantic.) The “point” at Heritage Point looks as if a pile of huge grey boulders were about to go over a cliff and were suddenly stopped by the hand of God. The windswept pile literally hangs over a sheer drop that eventually ends in the river. 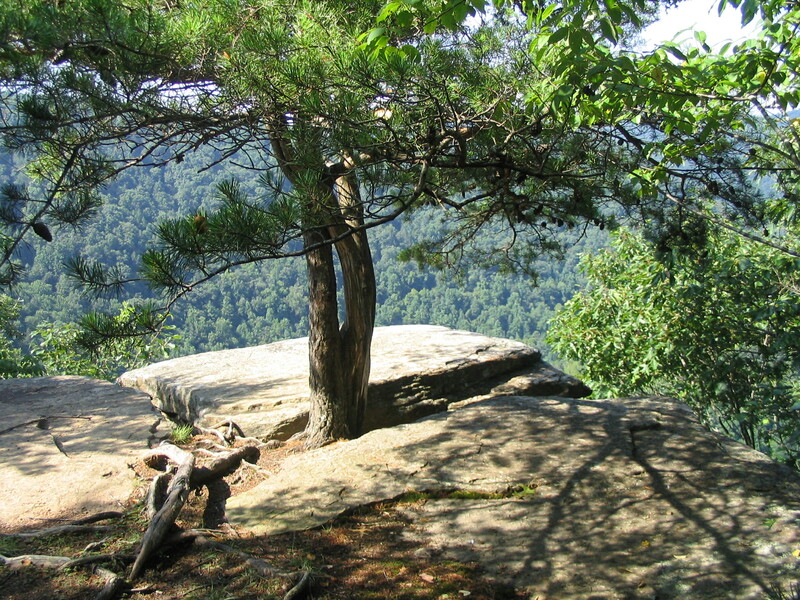 Between the two most prominent rocks there is a tree. It appears to be growing right out of the rocks. Short, scrappy and stunted by wind and snow, its roots reach down around the boulders into pockets of soil beneath the point. But when an observer looks more closely, it is not one but two trees, a pine and a cedar, so intertwined at their base that the needles and branches seem like they come from the same trunk. I hope I don’t need to unpack that obvious metaphor for marriage. Two become one. Different, yet the same. Reaching deep for nourishment. Standing on the Rock. You get it. Who do you wrap your life around? Who grows along side you steep cliffs of life? We’ve returned to Heritage Point many times, with our kids and by ourselves, and have seen 27 years of growth in the two trees. They seem stronger each year. And together they are certainly stronger than either of them would be alone on the edge of a cliff.